I have a slight irrational fear of getting addicted to medications and other body-altering things like melatonin and coffee. I belive our body has the power to do anything. Sometimes we need to help our body with bad headaches, cramps and more severe health issues. But other times, we need to let it do its job. I fear that if I take a tylenol everytime I have a headache, my body will depend on it in the future. It will loose it’s ability to combat the headache by itself. Same goes for coffee. Will my body ever be fully awake or fully functioning without it once I’ve accustomed my body to it? I don’t know. But I sure as hell don’t want to find out. And therefore, I’ve ditched coffee for a couple months now. But now it’s time for its comback! 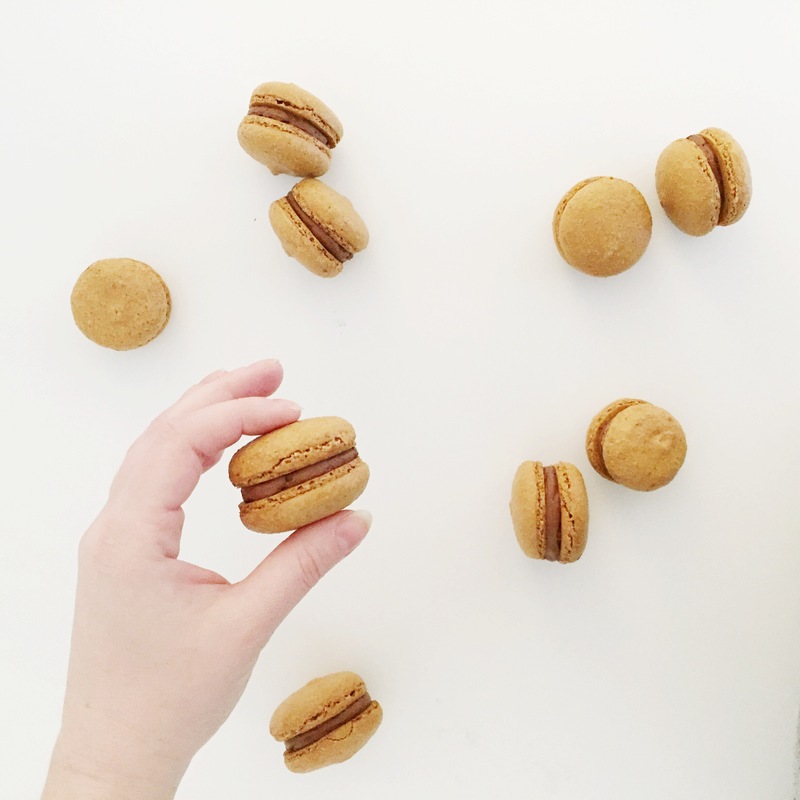 Meet your new favorite pick-me-up snack: the coffee macaron. In a large bowl sift flour, powdered sugar and instant coffee. In a separate bowl, mix egg whites with a stand mixer and gradually add the sugar until it forms hard peeks. Add two drops of orange gel coloring and mix for another minute. Incorporate the egg whites into the dry ingredients by using the folding technique. Mix until the mixture is smooth. Avoid over-mixing. Transfer mixture into a pipping bag with a #12 Wilton tip and pipe out circles. Let your macaron shells harden for 30 minutes. 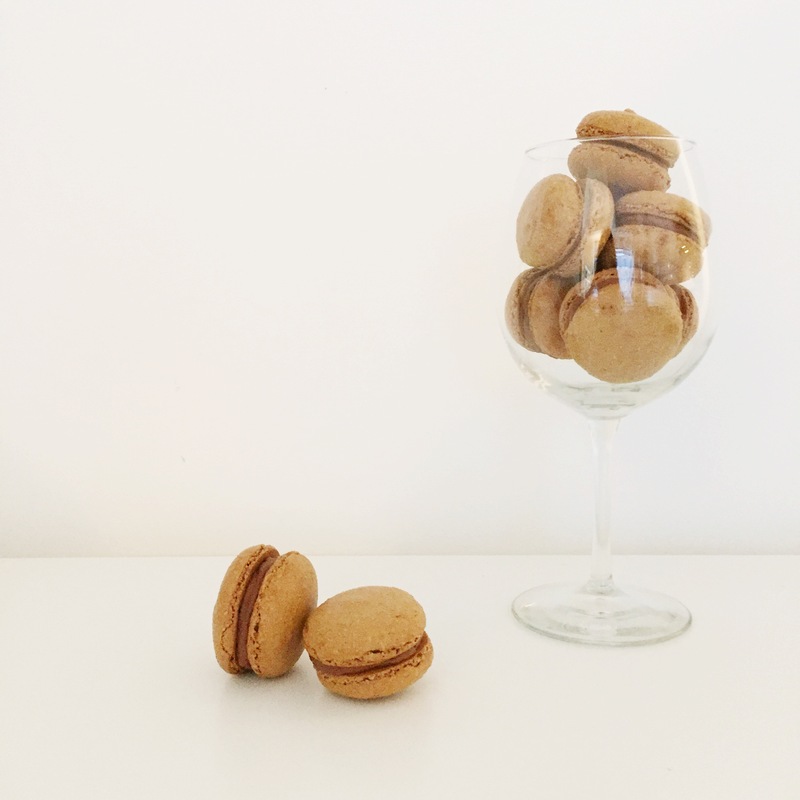 Bake macaron shells into a 350 degree oven for about 15-20 minutes, depending on your oven. They are ready when they sound hallow. Pipe in the filling into one shell and sandwhich it with another. Place them in the fridge for 24 hours and then enjoy. Place your dark chocolate and coffee in a large bowl. Heat heavy cream in a medium sauce pan. Wait for it to start to boil. Watch it very closely! Pour the boiling heavy cream on the chocolate bowl and mix throughly. Wait for it too cool for 20 minutes or 10 minutes in the fridge. Mix with a stand mixer until it begins to fluff up and become a lighter shade of brown.